Americans have several choices regarding the potential for income in retirement. Social Security and pensions are two of the most well-known and often accessed forms of retirement income. Annuities are an investment product that sometimes suffers from a bad reputation, sort of the way time shares do. But, when purchased with the proper amount of forethought and funding, annuities do provide income in retirement and some protection from market forces and tax charges. Investors are not, however, in love with annuities as a product for retirement income. According to Spectrem’s new study Investor Attitudes and Ownership of Insurance Products, only 17 percent of investors own fixed annuities, and only 12 percent own variable annuities. The market for annuities is mostly dependent upon conservative investors who do not look for sizable return on investment. Also, there are different rules regarding how annuities pay out benefits upon the death of the annuity owner, which causes some investors to decide against purchasing annuities. According to the study, the most popular reason investors do not buy annuities is that they believe they can have greater return on investment with other products and investment decisions. Twenty-four percent of investors believe the cost of purchasing an annuity are too high; annuities include a commission to the person selling the policy, and possible management fees if the annuity invests in a mutual fund. Twenty percent of investors say they do not trust annuities or the company selling annuities, which is obviously a perception problem. Sixteen percent note the limited potential for return, which is both a reason not to purchase annuities as well as a reason some investors invest in them. For example, the top reason investors did invest in annuities is the “predictable income stream”. Thirty-eight percent noted the set income promised by an annuity, and that includes 43 percent of female investors. Female investors are often more likely to prefer set return on investment over riskier but potentially higher investment options. 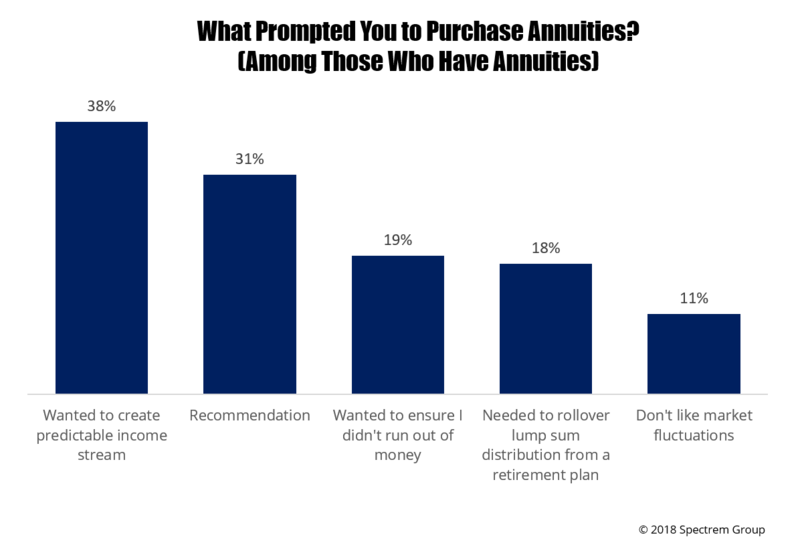 Thirty-one percent of investors said they purchased annuities due to a recommendation from someone, while 19 percent said they did so in order to provide income in retirement so they did not eventually run out of money. A majority of investors who purchased an annuity on a recommendation got the opinion from their financial advisor or financial planner. Only 13 percent of annuities were actually purchased as a result of an insurance agent making the pitch. A majority of annuity purchasers made the decision to buy their policy well before retirement (at least five years prior). But 22 percent purchased the policy in the five-year period before retirement, which obviously offers less return on investment and less retirement income when it is needed. The subject of annuities is one in which an advisor is far more likely to understand the workings and returns an annuity offers than the investor. Investors are likely going to hear about the advantages and disadvantages of annuities and come to you for advice. Be prepared, not only with basic information but also with an explanation for why you believe an annuity purchase is wise or unwise for each particular investor.